Lipomas are small, noncancerous growths that develop underneath the skin. While they do not present any immediate concerns for most patients, they can be surgically removed if they become unsightly or inhibit a patient’s functionality. This article is dedicated entirely to the topic of lipomas. We will define what exactly lipomas are, and discuss causes, symptoms, and treatment options. Lipomas are noncancerous growths of fat cells just under the skin. While they can develop anywhere in the body, they are most common in the neck, torso, thighs, and upper arms. We do not fully understand the underlying causes of lipomas. However, you are more likely to develop one if they run in your family. Because lipomas are noncancerous, they generally do not require immediate treatment. The biggest concern for most people is functionality and aesthetics. Lipomas that grow to be large can be unsightly or impede functionality. In these circumstances, surgical removal is the best and easiest way to treat the lipoma. 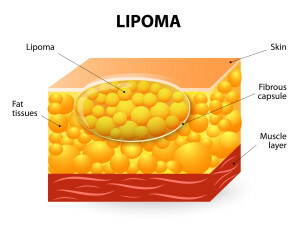 Lipomas may also be confused with other lumps under the skin such as cysts or soft tissue cancers. To treat lipomas, your physician will first need to accurately diagnose the condition. A physician can diagnose most lipomas using a simple physical examination. Once diagnosed, you and your physician can discuss whether to remove the growth or leave it alone. If there is any doubt if the lesion is more serious removal should be recommended. Surgically removing a lipoma is a quick and easy procedure. The patient is given local anesthetic to numb the area, and then the surgeon makes an incision, extracts the growth, and stitches the incision back up. If you are exhibiting symptoms of a lipoma, or have already been diagnosed, contact a skilled general surgeon to discuss your options for surgically removing the lipoma. Dr. Mike Koeplin is a Minnesota general surgeon with decades of experience successfully treating lipomas. Make your appointment with Dr. Koeplin today.